Before I get rid of the hangover from Indian Festive season, many other holidays passed through. I haven’t realized that winter has already entered in town. Means it’s time for my baking season. As I already missed Halloween this year I decided to make something special on Thanksgiving. It’s neither part of our culture nor I believe that we need specific days to remember our family. But it always feels good to be thankful to those people who make us special. And dedicating little time from your busy schedule for them, makes them happiest people on earth. Recently I have seen many of my fellow blogger friends are trying their hands on desserts with different vegetables like zucchini, pumpkin, beet, papaya etc. Not to mention I’m highly influenced with them and going through all their recipes with the bookmark. But many times I faced major problems with the ingredients. Like I never found good bread flour, don’t get proper seasonal fruits; I have to go long way to check whether the store have my desired meat or not etc etc. Exactly same thing happened with the canned pumpkin puree which I needed most for my next ‘baking session’. When there was no hope at all in the stores, I finally made it myself. Honestly speaking I’m surprised why the hell I wasted my time on hunting it from store to store when it can be made so easily at home; and also without any chemical agents or additional colors. It’s fresh and pure. 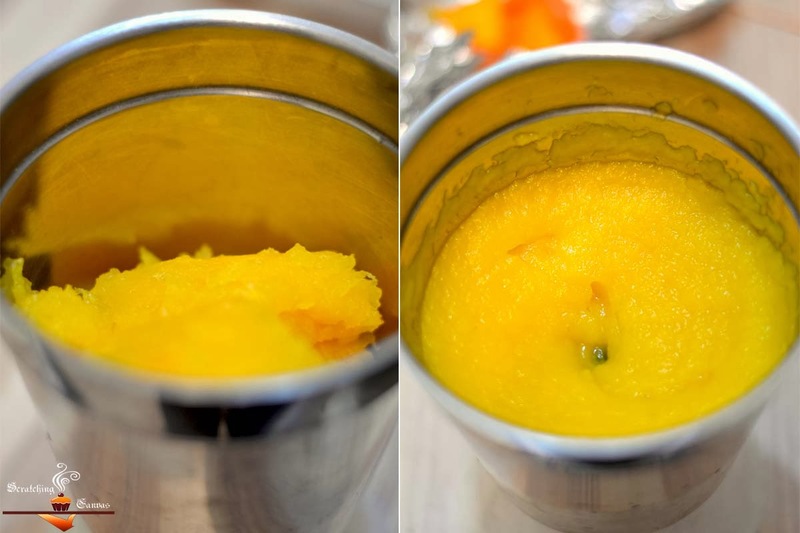 Here is the simple and easy recipe of Fresh Pumpkin Puree. 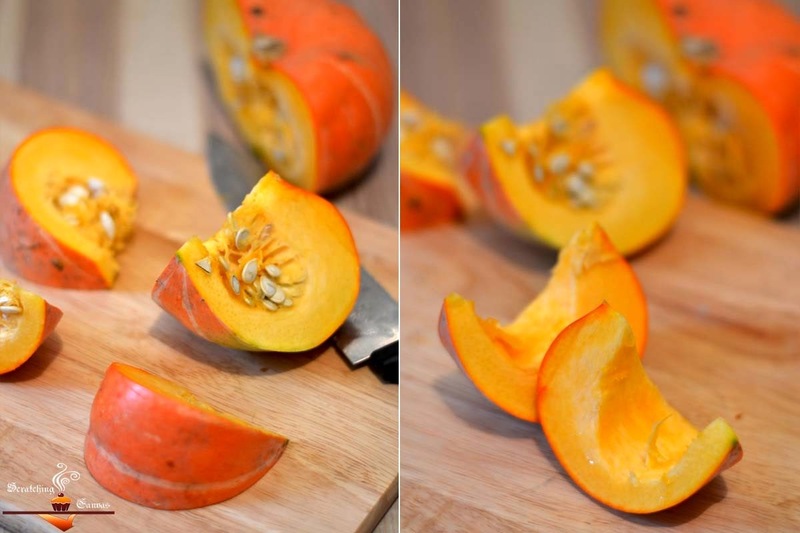 Cut the pumpkin in halves and then make few thick slices (like the picture below). Remove the seeds with a spoon or knife. Don’t discard the seeds; you can try out other recipes with them. So you better keep them aside. 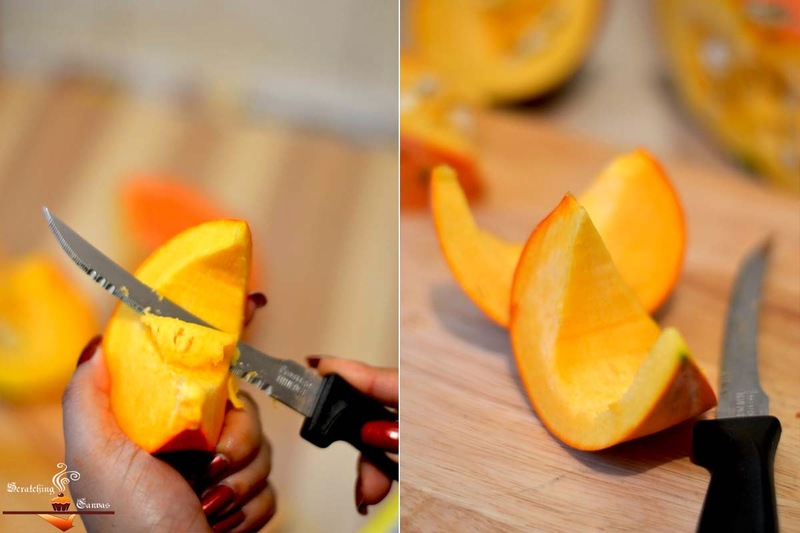 With a sharp knife clean the inner section of pumpkin slices. Make sure each slices are clean neatly. 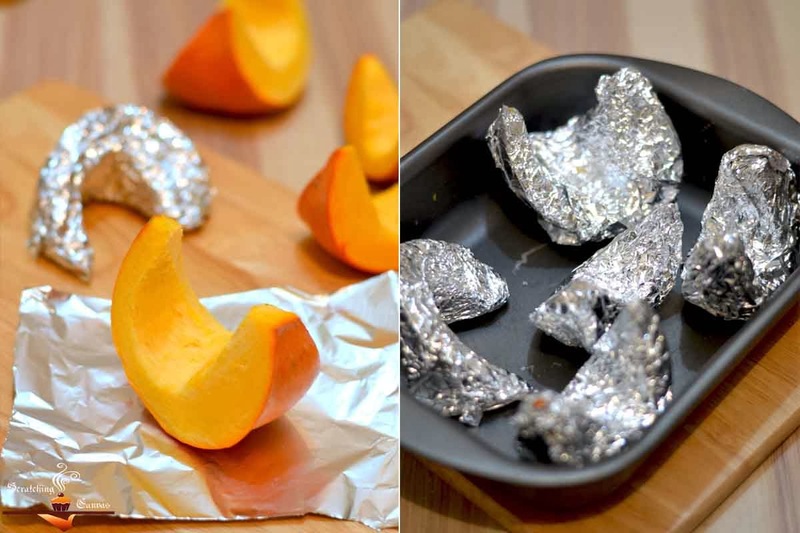 Spread the foil on your kitchen counter and wrap all the pumpkin slices individually. Make sure all slices are covered with the foil completely. Now arrange the foil wrapped slices on an oven proof tray/pan. If your pan is not large enough like mine, do it in batches. Now transfer the tray/pan in the oven preheated to 1800C and bake at 1800C for 45 mins. Or until pumpkin is fork tender. Remove the pumpkin from oven and allow it to cool a bit. 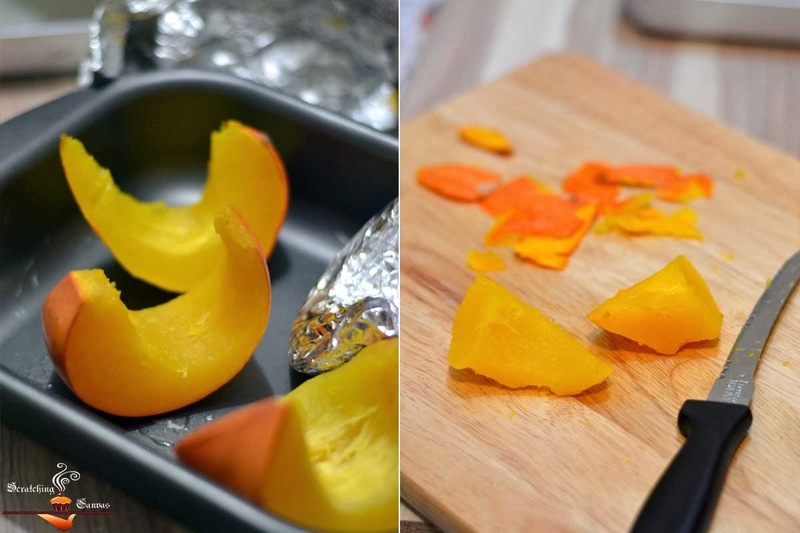 Carefully discard the foil and remove the skin. Roughly chop the slices. 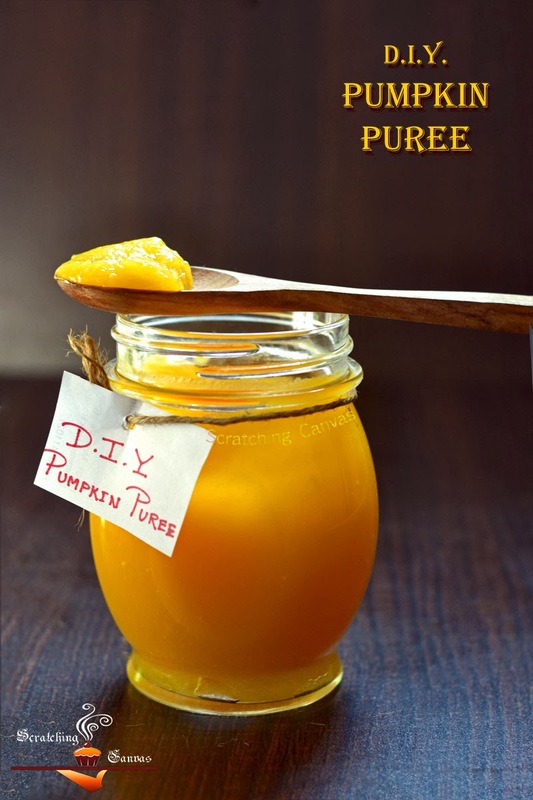 Transfer the pumpkin into a blender and blend for 1 min or until you get smooth puree. 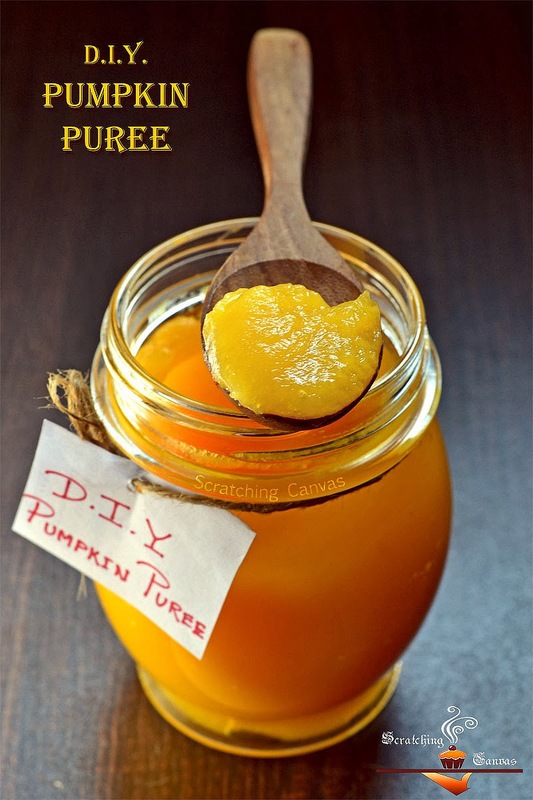 Your pumpkin puree is almost done; infact you can use it now. 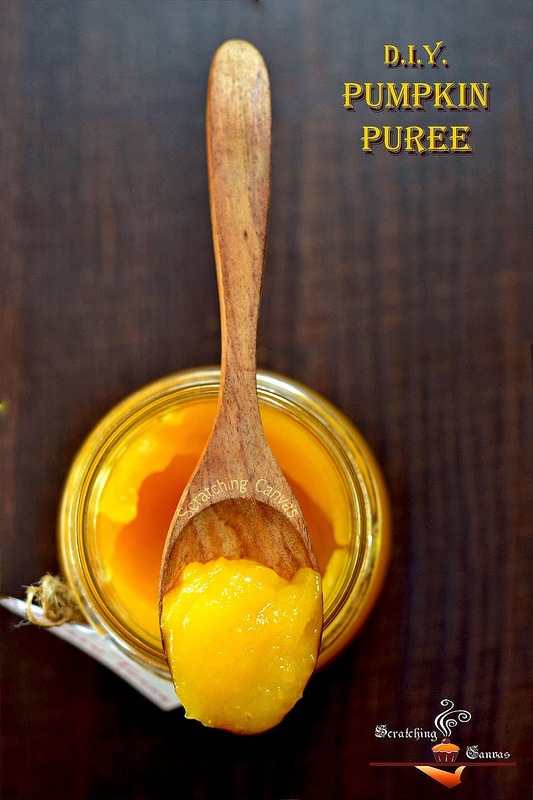 But I want my puree for baking so I needed the dense puree with less water content just like canned version. So I arranged the cotton cloth on the sieve and pour the puree on it; sieved the puree and pressed more to squeeze out the excess water. Lastly just transfer the thick dense pumpkin puree into a clean dry glass jar to store. 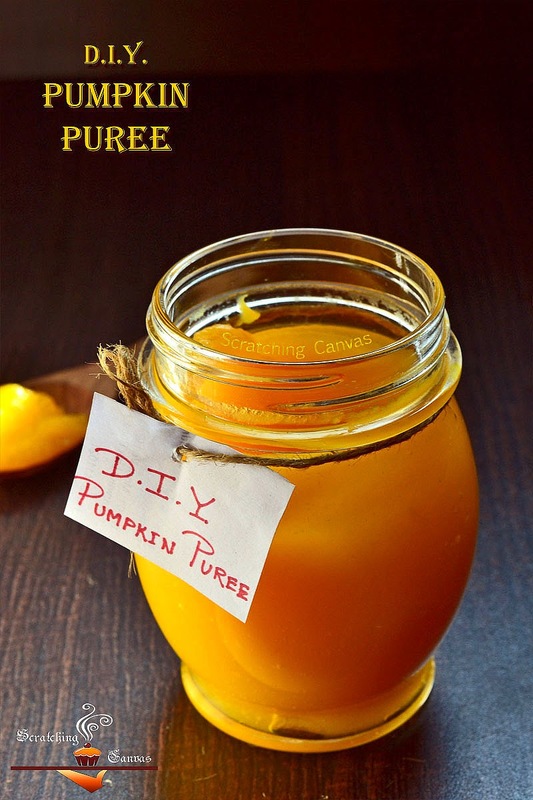 This pumpkin puree can be stored in any air tight container, preferable glass. This will be good up to 3-4 days if refrigerated. wow thats a very well explained post 🙂 and auseful one !! Wow Rimli, pumpkin puree color is so beautiful and well explain dear. Beautiful click.